Established in 1967, Security Engineered Machinery Co., Inc. (SEM) is the largest direct supplier of information destruction equipment and services in the United States for federal, state, and local government customers as well as commercial entities of all sizes. From paper to hard disk drives to solid state devices to optical media and everything in between, SEM has a solution that can eliminate and/or sanitize both Classified/Top Secret Information as well as Controlled Un-Classified (CUI) and/or Personally Identifiable Information (PII). In addition, SEM offers a nationwide shred service with a particular focus on the destruction of hard drives, personal computers, data-tapes, solid state devices, and other related electronic media. 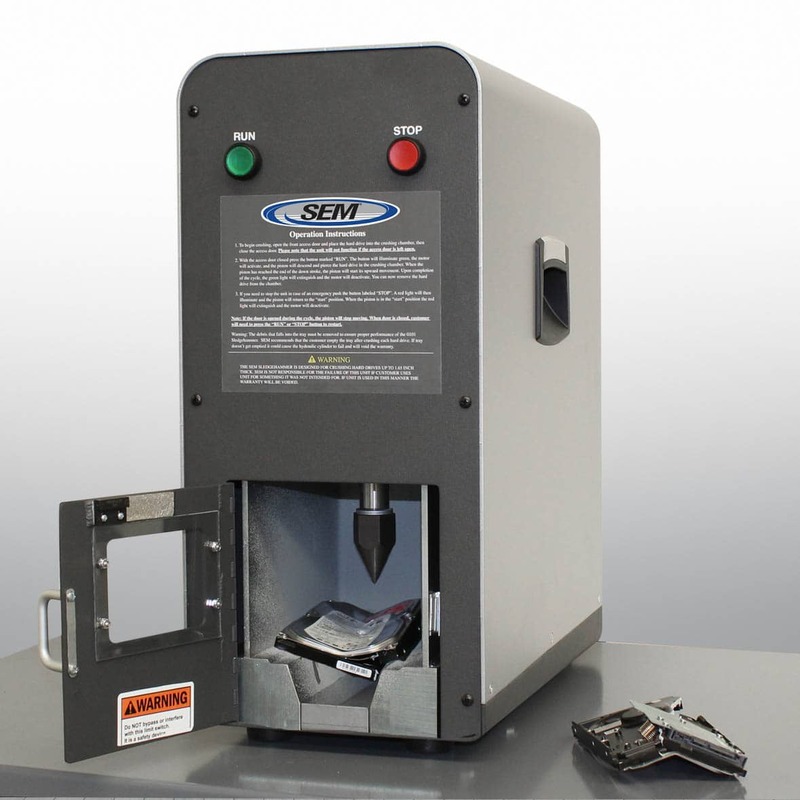 SEM also produces customized equipment for size reduction solutions and for destroying off-spec or returned product for the medical device, gaming, security printing, and food industries as well as bank-note/currency destruction for the US Federal Reserve and Central Banks throughout the world. Primary products include personal, departmental, and central destruction paper shredders, hard drive shredders and crushers, solid state device shredders and disintegrators, magnetic media degaussers, and optical media shredders and destroyers. In addition, as the inventor of the disintegrator in 1967, SEM continues to offer and service a complete line of disintegration systems designed for an office environment as well as larger centrally located systems for heavy duty, high volume applications that are supported by a variety of customized waste collection systems including briquetting. SEM is positioned to serve customers throughout the world. In the United States, direct sales offices are located in Massachusetts, Maryland, Virginia, Georgia, and California. Internationally, we have selected representatives in most countries with over 100 Authorized Service Centers being available worldwide. A full engineering staff is available to provide assurances that larger systems meet at-site requirements of our clients. SEM practices and is committed to providing “green” solutions in all of our systems. Since 1967, SEM has established a global reputation for quality, reliability, and customer service. Our customer service and technical support department is always accessible. Corporate customers and governments world-wide seek manufacturers and suppliers who provide high quality solutions, service, and support as well as suppliers who are responsible for their products. When it comes to a solution to effectively eliminate sensitive information or mitigate liabilities, SEM is and has been the first choice of the US Federal Government as well as numerous Fortune 50 corporate national accounts for over 50 years.Security Engineered Machinery (SEM) provides comprehensive end-of-life solutions for the protection of sensitive information in government and commercial markets. SEM’s reputation as the authority in high security information sanitization was earned through over 50 years of technical innovation, intellectual curiosity, and unrelenting integrity. By fostering a supportive, team-centric environment focused on talent retention and client satisfaction, SEM is recognized as the undisputed leader in depth of expertise, industry excellence, and reliability. SEM data destruction devices are the premier high security choice available on the market today.